Despite the summer heat,( which is completely gone now. As I am writing this it is pouring!) 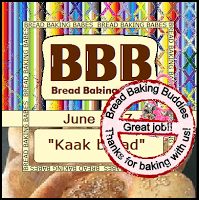 we had fun baking this bread and found there was only one Buddy baking! I waited an extra day but alas, not other takers for our Buddy Badge. The first and (only) to mail me with results was Gilead, who not only made a vegan version but also baked the Ka'ak in this interesting oven (see below). Now I want one too! I really think I need such an oven in my life! Well done Gilead! Thank you for baking with us, you're a real trooper! O yes Karen I see what you mean... that oven is great!! Love the breads Gilead made! Once again, what a terrific choice of bread for us to bake this month, Karen. Many thanks again. Wonderful breads Gilead! Out of a fabulous oven...and yes I'd love one of those as well.